While the number of foreign students hosted has declined in recent years, South Africa remains an important destination for international students, particularly those from other African nations. Although France and the UK continue to attract the majority of internationally mobile students from Africa, South Africa is not far behind as the third-ranked destination. According to a recent analysis by the education agency Campus France, a growing number of African students are choosing to stay within the continent. 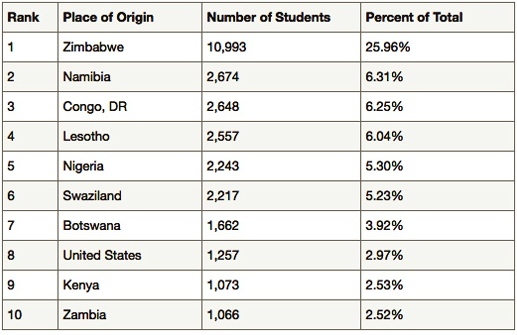 South African hosted nearly 43,000 foreign students in 2014, down from a recent-year high of just over 70,000 in 2011. Nine of the top ten sending countries to South Africa are located in sub-Saharan Africa, with the single non-African slot occupied by the US. The chart below, courtesy of UNESCO, features data from 2014. The top ten sending markets for South Africa, 2014. Source: UNESCO. South Africa is close to home for students from sub-Saharan Africa, the cost of living is reasonable, living conditions are good, and visa requirements are often minimal. South African higher education is affordable, particularly relative to the UK and US, and government subsidies exist under which regional students pay the same fees as local students. South African schools are considered to be of high quality, and South African qualifications are well-recognised across Africa. South African institutions often offer courses not available in the students’ home countries, and admission requirements are flexible. Political unrest or uncertainty in students’ home countries drives outbound mobility, while South Africa’s relative political stability has been an attractor (although recent student protests have impacted this perception). Under agreement with the Southern African Development Community (SADC), 5% of South African higher education places are reserved for students from member states. Other factors include the relatively greater range of research opportunities in South Africa, and an interest in the country’s culture. Yet another element is the fact that, though South Africa suffers from a well publicised skills gap, academic programmes are nevertheless still more closely aligned to labour markets than is the case in many neighbouring countries. South Africa is also a leader in mobile learning, particularly in using cellphones as conduits for course content. While a minority of the population possesses tablets and smartphones, basic cellphone utilisation is around 90%. SMS messaging has proved to be a useful education tool and in one notable example the MoMath Project used cellphones to reach 25,000 learners, resulting in a 14% increase in mathematics skills for participants. Many observers see cellphones as a way to assist students who have access to higher education but lack the financial and logistical support needed to complete their degree studies successfully. Smartphone and tablet usage are among the highest on the continent. Smartphone usage is approximately 37%, while the average for Africa is less than 20%. General internet penetration in South Africa is third-highest on the continent, behind only Kenya and Morocco. Among South African business professionals, smartphone and tablet usage jumped from 47% to 59% and 76% to 89% respectively between 2013 and 2015. This growing availability of technology, and the embrace of it by higher education, is yet another draw for students from neighbouring countries. Despite all the advantages noted above, South Africa has some challenges as well. Foreign students are sometimes treated inhospitably, largely due to the perception among locals that both jobs and university places are under threat by the increasing pool of foreign students. Another element of concern is access to affordable housing, which can be difficult to obtain due to the local perception that foreign students have greater financial resources. Most recently, the country’s English Language Teaching (ELT) sector saw its enrolments decline sharply due to a 2014 change in visa policy that was ultimately addressed through a 2016 court challenge. The university system has officially broken with the apartheid system of the past, but discrimination related to race, gender, and socio-economic standing have persisted. South Africa is about 80% black, but black enrolment levels at universities such as the University of Cape Town are less than 25%. Fees of any sort are seen as disadvantaging black students, who typically come from economically challenged backgrounds, which is in itself part of the legacy of the former apartheid regime. For decades, students have called for free education in order to make universities more accessible to marginalised students, but the government instead relies upon subsidies such as the National Student Financial Aid Scheme (NSFAS) to try and level the playing field. However, government programmes have not served all students needing aid, and higher education is generally underfunded, with 0.7% of gross domestic product earmarked for the sector, a low percentage by international standards. At the same time, fee hikes are seen by both universities and the government as a way to bridge the fiscal gap for higher education institutions, but in the context of demand that has doubled over the last two decades, a 50% poverty rate, and inadequate financial aid, students have pushed back. The latest round of unrest occurred when Minister of Higher Education Blade Nzimande announced at the end of 2016 that government approval had been granted for university fee hikes up to 8% for 2017, this despite the current inflation rate being 6%. Any green light for raising rates would have been seen by students as further disadvantaging groups facing serious obstacles to university education, but approval for hikes beyond the inflation rate triggered fresh protests from frustrated students. Protests and associated questions concerning whether higher education can be adequately funded, have had negative impacts on the reputation of local universities. While the University of Cape Town and the University of Witwatersrand both reside in the top ten of the Times Higher Education BRICS & Emerging Economies University Rankings 2017, the 2016 QS World University Rankings has them sliding in the case of the University of Cape Town twenty places to 191st worldwide, and twenty-eight places to 359th for the University of Witwatersrand. The unrest also resulted in the temporary closures of some universities and has caused some foreign students to reconsider studying in South Africa. Mindful of the level of disruption that has occurred, the government has taken steps to address these problems. In order to help foreign students who experienced any inconvenience or administrative delays due to protests, it issued a blanket visa extension to those whose documentation had been set to expire at the end of 2016, setting a conditional date of 31 March 2017. In terms of the government addressing the concerns of South African students, the obligation to do so is set forth in the constitution, which states that all citizens have the right to further (as opposed to basic) education, and that the state must make this “progressively available and accessible.” The National Development Plan, adopted in 2012, and the Durban Statement on Transformation, from 2015, list a series of goals for strengthening higher education in South Africa. While the National Development Plan concerns itself with effective governance of higher education, adequate staffing, better financing, and other top down goals, the Durban Statement directly targets student needs. Among its resolutions are greater transparency and engagement relating to fee structures and increments, more supportive and expanded student funding models, and a general understanding that higher education is a public good. The government has now also agreed to pay the 8% fee increases of all NSFAS-eligible students, and to pay the fee increases of all students from families below a certain monthly income level. It has also pledged to cover students in similar categories in Technical and Vocational Education and Training (TVET) colleges. South Africa would need an estimated R250 billion (US$18.45 billion) in additional funding to pay for free tertiary education for the next three years. The country cannot support that expanded budget so while many students are unable to afford higher education, the government is unable as yet to make it freely available. In the long term, South Africa needs to respond to increasing demand for tertiary education from local students yet continue to offer access to foreigners. While university rankings have recently slipped, the World Bank has found that South Africa still has high private returns to tertiary education. Thus, a degree remains the passport to a good salary and stable employment, in the country and beyond. This entry was posted in Africa, Regions, South Africa and tagged student recruitment, international students, undergraduate admissions, postgraduate student recruitment, student enrolment.